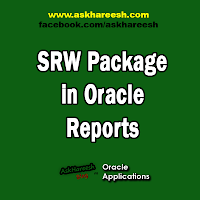 SRW (Sql Report Writer) Package is a built in package in Oracle Reports Builder. It is a collection of PL/SQL constructs that include many functions, procedures, and exceptions you can reference in any of your libraries or reports. The PL/SQL provided by the SRW package enables you to perform such actions as change the formatting of fields, run reports from within other reports, create customized messages to display in the event of report error, and execute SQL statements. There are nearly 70 functions, procedures, and exceptions are there in this package. Here I am giving brief information and uses of few important functions, procedures, and exceptions. It is a Procedure that displays a message with the message number and text that you specify. It is mainly used to debug a report in Reports Builder. This exception stops the report execution and raises the following error message: REP-1419: PL/SQL program aborted. SRW.PROGRAM_ABORT stops report execution when you raise it. This procedure executes the specified SQL statement from within Reports Builder. The SQL statement can be DDL (statements that define data), or DML (statements that manipulate data). DML statements are usually faster when they are in PL/SQL, instead of in SRW.DO_SQL. Since you cannot perform DDL statements in PL/SQL, the SRW.DO_SQL packaged procedure is especially useful for performing them within Reports Builder. REP-1425: Error running DO_SQL package – REP-msg ORA-msg. This function returns the file name of the report being executed.